San Francisco/ New Orleans X-Ray Book Co. 16mo. Chapbook, hand-sewn. 300 numbered copies. 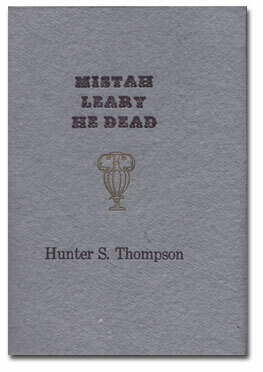 Two pages are Hunter's obituary for Timothy Leary, originally printed in Rolling Stone magazine. Front and rear grey wraps fold out; on the rear fold-out is attached a scored simulated sheet of blotter acid with Leary's likenesses printed in magenta on a white. Printed by Hand in New Orleans.